Japan is publishing Monetary Policy Meeting Minutes along with the US releasing House Price Index but none have a major influence on USDJPY. 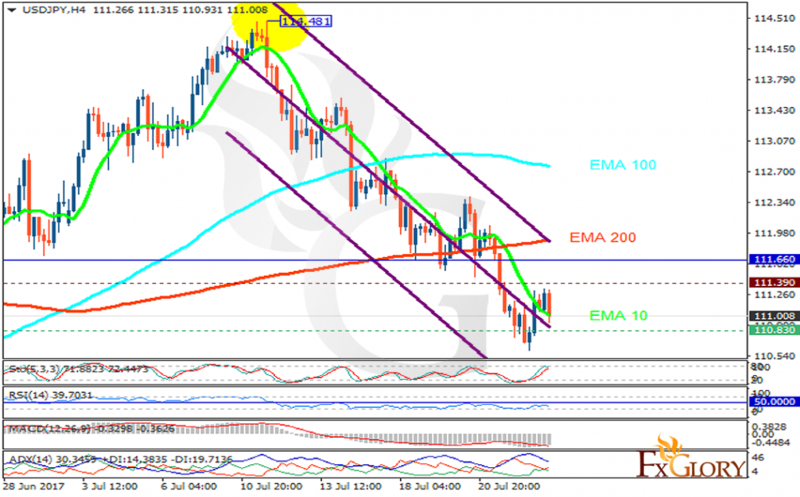 The support rests at 110.830 with resistance at 111.390 which both lines are below the weekly pivot point at 111.660. The EMA of 10 is moving with bearish bias along the descendant channel and it is below the EMA of 100 and above the EMA of 200. The RSI is falling towards the oversold area, the Stochastic is moving in high ranges and the MACD indicator is in negative territory. The ADX is showing weak sell signals. USD is acting weak against many major currencies therefore short positions are recommended targeting 110.5 area.